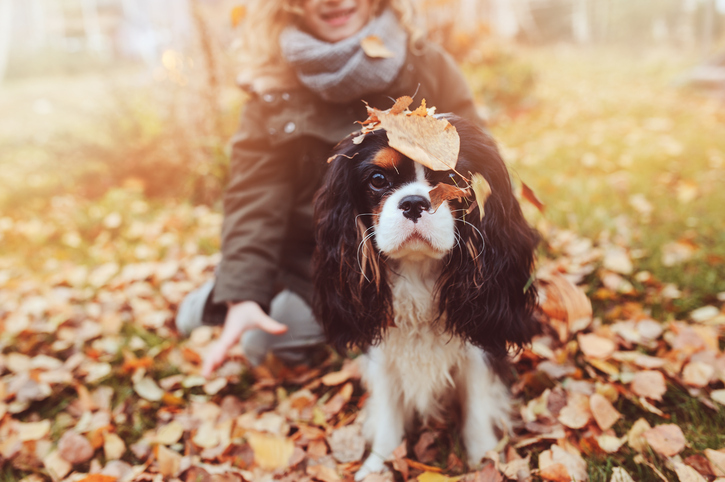 Autumn is a beautiful time of year but not without hazards for our pets. As it gets dark earlier in the evening, make sure you and your dog are visible when out walking. High visibility jackets and vests plus lights you both wear are a good idea. Rural areas often are without sidewalks and street lights so, in addition to choosing safe places to walk, be sure that drivers and others can easily see you and your dog from a distance. Fall is one of the mushroom seasons. While many mushrooms are not toxic, some are, and the toxic mushrooms are often hard to distinguish from the non-toxic ones. These mushrooms can be a risk to dogs so the best way to prevent pets from ingesting poisonous plants is to keep them away from areas where any mushrooms are growing (like wooded areas). If you suspect your dog has ingested a mushroom, take the dog to the nearest veterinarian right away and, if you can, bring the suspected mushroom. While symptoms of mushroom poisoning vary depending on the type of mushroom ingested, vomiting, diarrhea, lack of coordination, weakness, jaundice and drooling are some common symptoms. Some people use rodenticides around their home as rodents look for indoor areas to live as the weather gets colder. These products are highly toxic and can be fatal to pets. Any pet who may have ingested this poison should be taken to the nearest veterinarian immediately. A pet who has ingested rodent poison may have pale gums, be bleeding from the mouth or nose, drink more water and have seizures. Ethylene glycol-based coolants (found in anti-freeze and hydraulic brake fluid) are also highly toxic so avoid having pets near these products. Propylene glycol-based coolants are much less toxic than other engine coolants. Symptoms of poisoning by ethylene glycol include uncoordinated movement, vomiting, excessive urination, diarrhea, rapid heartbeat and depression. Halloween and “trick or treating” can be very stressful for dogs so, unless the dog is extremely comfortable with loud noises, people dressed in unusual clothing, and the excited behavior of children, I would leave him at home. If you choose to bring the dog, make sure he is leashed, wearing current identification, even a tracking device and is very visible (with a flashing collar and reflective coat available at pet supply places). For dogs who are staying at home, the sound and sight of trick-or-treaters repeatedly appearing at the front door can be frightening, and some dogs may become territorial, so containing worried dogs in another part of the house reduces their anxiety and prevents them from running out the front door. In addition, many dogs are afraid of fireworks so keeping dogs inside prevents them from running off at the sound of fireworks. Chocolate and products containing xylitol are poisonous to dogs while novel pieces of costumes can be hazardous to dogs if ingested. Keeping these items out of reach of dogs will help avoid an emergency trip to the vet. For pets that find Halloween very stressful despite owners’ efforts to keep them safe and calm, there are products to help. For example, plug-in dispensers of calming species-specific imitation pheromones are available at most vets. Vets can prescribe pharmaceutical products if a pet needs them. Have a wonderful and safe fall season!